After collecting items, I set up a table with the materials, a large bowl of water for testing and a large plastic tray/lid to put our tested, floating objects on. Testing the objects. Use this time to talk about why things float. Encourage your child to guess whether each item will float or sink before testing. Older/more advanced children could keep a written record of this. How about some added early Literacy? It's a great challenge to make things on water as they keep floating away! - Extend this activity by providing a greater focus on the science behind objects sinking and floating. Older children can begin to process things like density and surface area. As suggested, have children predict whether items will sink and float before testing. Have them write up the process in a Science journal or with a basic scientific proforma. -Ask questions to help connect their understanding, eg. "Do you think that will float or sink?" "Why do you think the big lemon could float?" "How are you going to get that to stay in that position?" etc. So pretty, what a lovely idea. We love anything where you bring the outside in and adding water you can't go wrong! Lovely ideas, and so pretty! This is so cute and really pretty too! It would be a cute idea to do for a party. The kids would get a kick out of their work being displayed on the table! I love your site, and I really love how you give ideas on how to adapt your projects for different ages and stages. Thanks! Thank you for sharing your Water Bottle Fountain post with our Bonbon Break readers this week too! We are thrilled to share your great work and site with our readers! Oooh this is sooo pretty!!!!! Great to combine science and art! I love this post, Debs. Your photos are beautiful and it looks like an activity that any child would love. Those are so pretty! And a great deal of learning involved too! Thanks for sharing! What a lovely little activity. My daughter has become obsessed with picking flowers at the moment. Today we made a floating garden for the fairies- but I might just suggest some floating art tomorrow. How fun, and pretty! This is now on my to do list with my 4 year old. Thanks so much for linking up with Tip toe thru Tuesday. I hope we see you next week. The images are amazing. Seeing flowers floating in water has such a calming effect. I would totally have bronze pots with floating flowers around the house if my kids were a bit older. So simple, yet there's so much learning in this. I love the handy tips, they really are handy. The images are beautiful too, the framed flower is my fave! This is such a gorgeous idea! 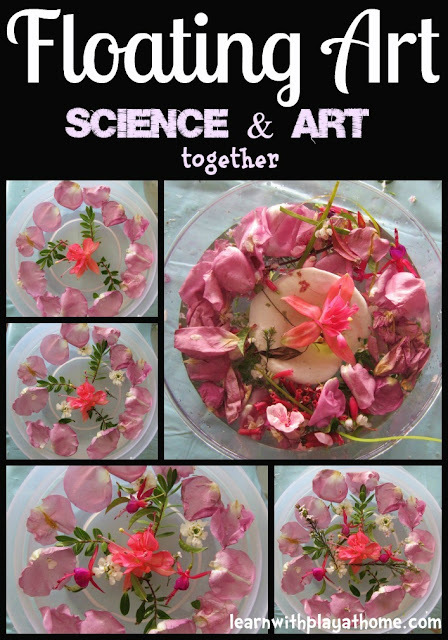 I love how you have brought science and art together into one fabulous activity. I can imagine my kids making a bit of art soup with all the flowers and plants too! Love it Deb! I have a 3.5 year old girl too who would just LOVE this. What a perfect idea!!!! Great activity Deb! Love all the colours and pics are just so pretty! Where did you get those tongs btw? So many wonderful ideas here...off to pin now!